(suzhappy724) I joined Listia way back in 2010. I must say right now that “I am addicted to Listia!” My house is a littler dustier and we use mostly paper plates. I have learned to juggle my phone in one hand while ordering a pizza and my iPad in the other while trying to win an auction. I no longer have 2 full rooms devoted to Listia (future auction items, shipping supplies, etc.) but I have spread out to the attic and half the basement. Who needed that chest freezer and foosball table anyway?! My boxes and totes full of makeup and body lotions are far more important… aren’t they? You better believe it! And if it can’t be won on Listia then you can expect to get no birthday/Christmas gifts from me!! The people you meet here are the absolute BEST too because you just know that they have their own boxes and tubs and totes full of treasures and their BFF is the same as yours ~ The Mailman/lady of course!! (meggross9) When I first stumbled onto Listia, I expected to sign up, browse the site and forget about it. When an offer sounds too good to be true (and Listia sounded AMAZING) it usually is, right? Well, Listia turned out to be all that it claimed to be AND BETTER! I do all my birthday and Christmas shopping FOR FREE! I’ve met a number of people who have become true friends and connected with a bunch of folks to swap fun and silly, but also essential and even life saving medical supplies with. Where else can you get a brand new Xbox 360, a phone, a tablet and diabetic test strips for not a single cent? And, yes, these are all things that I’ve won! And the best part is, you don’t have to make anything like a job or a business. I work 40 hrs a week and still have time to just check in, post a new auction, bid or comment just for fun. I have now been a member for two years and still can’t believe that a silly, absent-minded girl like me is making friends and saving money with 100% positive feedback. And I have to give all the credit to the Listia moderators for that! 9 out of 10 of the people I connect with are honest and kind, and with the watchful eye of our moderators, I never have to worry about being taken. Thank you, Listia for putting gifts under my tree and happiness in my heart. (123SHARON) I absolutely love Listia!! I’ve been on for 3+ years , met a lots of wonderful sellers and watchers. Became great friends with so many; it’s like having a huge family which keeps growing! Listia is the best place to find outstanding items and perfect for giving unwanted items to someone who can reuse it. LISTIA IS LIKE A HOME AWAY FROM HOME!! Getty Images for The Les Paul Foundation. For many June is a month for high school graduation – a day filled with smiling photos and celebration. For Beth Barbis this year had a few extra camera flashes as she walked won the red carpet with her father at the Les Paull 10th Anniversary in New York City. The sold-out tickets, won by her mother Krystal on Listia, were a special graduation gift for Beth and a birthday present for husband Glenn. From Glenn’s extensive record collection to Bethany’s saxphone playing, music runs deep in their familiy. So it was the “opportunity of a life time” to attend the 100th Anniversary event was in honor of Les Paul – the father of the solid body electric guitar. Les Paul is widely known as the inventor of multitrack recording, overdubbing, delay effects, and many other recording innovations that today’s recording artists use every day. Venturing from Conemaugh, PA, just outside of Pittsburgh, they started their night walking down the red carpet in front of over 50 news crews who clamored to get the photo. 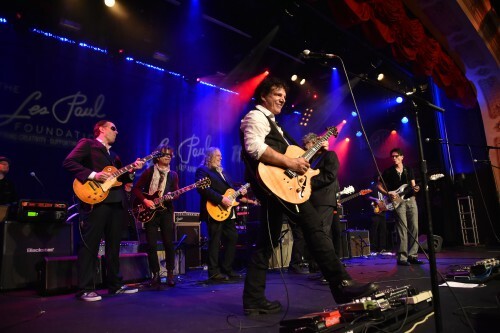 Later the Barbis’ enjoyed a sold out performance by rock legends Joe Bonamassa, Steve Miller, Warren Haynes, Steve Vai, Neal Schon, Johnny A, Count’s 77 and Joe Satriani. Beth had the chance to turn the tables and take photos of the stars and papparazzi herself before they headed to an exclusive invite-only after-party jam session with other musical greats at The Iridium Club on 51st which is where the great Les Paul played every Monday night up until his passing. There they were greeted with VIP seating, food and a giant birthday cake in the shape of the famous Les Paul guitar. Exhausted from all the adrenaline and seeing all the amazing guitarists play, they headed home late at night from their “once in a lifetime” night in music history. Beth will be studying Photography and Business at Robert Morrison University in the fall. You can view her photos from the night here. Stay tuned as we bring more extraordinary items to our marketplace and make Listia the best place to declutter and simplify your life while getting things you’ll love and use! Listia Stories: I’ll Be a Member for Life!! (billshelton) I’ve been a member since Oct. 2012 and I’m hooked! On a past Christmas, a buyer won a Superman comic card from me. After receiving the card she told me that Superman was her brother’s favorite super hero. She told me that he had passed away the Christmas before and it had put a painful stain on Christmas. Seems he had 3 grown daughters also. Their story really touched my heart. I collect comic books and I have over 6,000 of them (I sometimes buy more than one copy of a comic which I think will be important for some reason). I had a comic book where Superman gets beat to death, a comic book where the public puts up a statue and mourns his passing, and a comic book where he comes back. It just so happened that I had 3 copies of each of them. So I packed them in separate “do not open ’till xmas” boxes and sent them out. I also sent a set of kitchen towels and potholders to the sister so I didn’t leave anyone out. I don’t remember what I said in the letter I sent with them but it was something about him still watching over them and even Superman can die. They sent me a letter (snail mail) about how there was not a dry eye in the house when my letter was read. They said they didn’t know that a total stranger would feel this way and be so kind. I didn’t tell them but of the 3 copies of each comic book, 2 were extras and the third came from my personal collection, so I don’t have them anymore. With their letter and card they sent me a photo of them holding the comic books. This was so touching to me that on a special spot on my living room wall is the photo and letter and envelope (it has Superman on it) set in a frame. We have emailed/talked many times since. Now all the comic books I sent were worth several thousand credits (or a lot of cash) but that never crossed my mind. As it turned out, I got 200 credits for the comic book card and 4 really cool friends for free. What else could a guy want? This is just one example of many. I’ve made many friends on Listia from all over the U.S. and the world that I wouldn’t meet any other way. I want to thank Listia for helping me to be in contact with so many different people. I’ll be a member for life!! ( zarifasabah) I joined Listia over a year ago and I love it! I am married and have 2 boys (ages 2 and 4). My children love it when the mailman arrives and get super excited. We lost our home and we’re staying with family, which was very hard. I heard about Listia On Facebook, and I couldn’t believe it. So I tried it, and have been addicted to since. We have come a long way since I first joined Listia. I enjoy helping people, as I know how it can be. I love the friends I’ve made and the people I can help. Without Listia I would be lost. It’s a part of me, and my family as well. Paying it forward and also getting a chance to buy, sell, and trade items is just wonderful. Thank you Listia for everything you have done for my family, and myself. (NawnCaptain) I signed up but did nothing for six months when one fine day, I was bored & hankering for something to do. Google led me back to Listia, I remembered I had already signed up so I thought, “hmmm, let’s just see what this is about.” Listia is very user-friendly when it comes to listing items. This affords anyone the ability to list what they don’t want & earn credits towards what they do. I have been able to use my credits for a myriad of items that I would otherwise not be able to afford. Being creative when listing is fun to me … just one look through the Health & Beauty category (where I mainly list), will show that I am not alone & lots of us love using our imaginations to create wonderful auctions. I could easily site many more examples of why I love it here, but by far, the number one reason is the community of awesome people. Friendships form organically, they just happen, and I could not be more thankful. I work from home & this can make for a lonely existence, but those days are long gone. My friends have seen me through a very stressful couple of years & they are they are priceless to me. I never could have imagined being bored one July day would result in me gaining so, so much. I will forever be grateful for Listia for this opportunity!